Londoner Kim Laidlaw has lived in Paris for 15 years. She writes about the City of Light for various publications, including BBC Travel, Lonely Planet and Condé Nast. She is the founder and director of Unlock the Agency, which creates brand content and social media strategy. Having managed to survive into her thirties without really appreciating how connected the mind and body are, it took a couple of stress-related ailments for her to really start changing her outlook. As a result, she’s now on a quest to keep healthy both mentally and physically. Here are her top addresses in Paris to contribute to overall, holistic wellbeing—inside and out. Yoga is more than a practice, it’s a philosophy—and Mirz Yoga founder Marine Parmentier appreciates that as much as anyone, having discovered yoga as a way to help stomach pain that traditional medicine was unable to cure. Her mission then became to transmit the teachings of yoga in an accessible and digestible (no pun intended) way; to create a complete wellbeing experience open to all. Here she and her team teach a variety of yoga classes, including their signature R&B yoga sessions to a soundtrack of Rihanna, in a light-filled studio housed in a former printing works in the 19th arrondissement. Healthy lifestyle workshops and week-long retreats are also organized and the experience extends beyond the mat to both the yogic cuisine of Mirz Kitchen and the boutique, which sells a selection of health and wellbeing brands, including their own brand of yoga wear made in France. In a city as densely packed as Paris, sometimes you need to get away from the hustle and bustle—and country cottage-style day spa Free Persephone makes for a bucolic setting in which to do so. The warm and welcoming space features chintz armchairs for pedicures and a large wooden table for the communal manicure station, taking you on a quick country break while in the heart of the Left Bank. Highly recommended is the Anti Stress package, which includes six thoroughly restorative treatments, including Relaxing Deep Tissue Massage, to counteract the wear and tear of the daily grind. This newly opened branch of grocery store Le Zingam in the 11th arrondissement is the second shop in Paris for duo Lelio and Sonny, two friends who are obsessed with good, well-sourced, high-quality food. Their venture was born of a desire to reconnect the consumer with the producer by providing an alternative to supermarkets and organic grocery chains. By making produce from small producers accessible, they bring food from the field directly to their customers, thus creating a link from the rural to the urban in the middle of Paris. On sale are crates upon crates of fresh, seasonal fruit and veg, as well as cheese, cured meats, eggs and dried goods (grains, pasta etc.). Having originally started out in New York, American acupuncturist Hayley Enright came to Paris in 2013 with her husband and dog to bring her practice here to the City of Light. Hayley uses her gentle, pain-free technique to stimulate acupuncture points, in sessions that take place in the comfort of your own home, or indeed in her own relaxing space chez elle. She also hosts once-monthly “Art + Zen” low cost days - 30-minute-long group sessions at an affordable rate of 20€ - as well as workshops, which, in the case of the recent “Happiness Project”, combine yoga, acupuncture, meditation and massage. Psychiatrist and psychotherapist Christine Barois opened Paris’s first (and, so far, only) meditation bar earlier this year, not far from Palais Garnier, with the aim of providing anyone and everyone with the possibility to discover the discipline that she has been practicing for ten years. The pared-back space features two studios—for both teacher-led and unguided sessions—and hosts classes non-stop throughout the day, from Monday to Friday, focusing on themes such as breathing, emotions or meditation basics. There are also sessions aimed at teenagers and children, as well some in English. Keeping your mind nourished and inspired is essential for mental wellbeing and, indeed, in Paris you are spoilt for choice with the crème de la crème of museums in which to do so. However, being surrounded by throngs of tourists may slightly mar the experience—so best to go off the beaten path, at an off-peak time on a week day, for a more intimate dose of culture. For a fantastically enchanting moment in a fairy tale setting, take a trip to the Musée de la Vie Romantique in the suitably-romantic Nouvelle Athènes neighbourhood—a real treat of a museum, housed in the splendid former residence and studios of painter Ary Shaffer, and set in a picturesque garden, where you can take a mindful pit stop amongst the roses in the warmer months when the café is open. This is my most personal choice in this selection of places in Paris, as I have lived in the 18th arrondissement for 12-odd years and stroll with my dog daily up to the top of Montmartre. It’s during this ritual that I really notice the changes in the seasons, seeing the leaves change from green to red and then falling, only to come back to peak lushness as spring rolls around again. It’s like a village, with its cobbled streets, old-fashioned lampposts, mews lined with ivy- or wisteria-clad houses, and the somewhat incongruous-in-a-capital-city vineyard. I hear the birds chirping, feel the sun shining and have a view over Paris from here (plus my glutes get a good work out as I climb the interminable flights of steps)—all of which have made this an essential, mindful, daily exercise for me and, for this reason, I highly recommend getting lost here. Vegan food was once the stuff of fantasy in the city of creamy, buttery delights but Pinson was one of the first on the scene to really change that. This Northern Marais hotspot serves seasonal, organic, home made food inspired by the principles of naturopathy, which is both wheat and dairy free. Sample delights such as beetroot and sweet potato curry, washed down with a vitamin-packed fresh juice, all in a light, bright and breezy space. 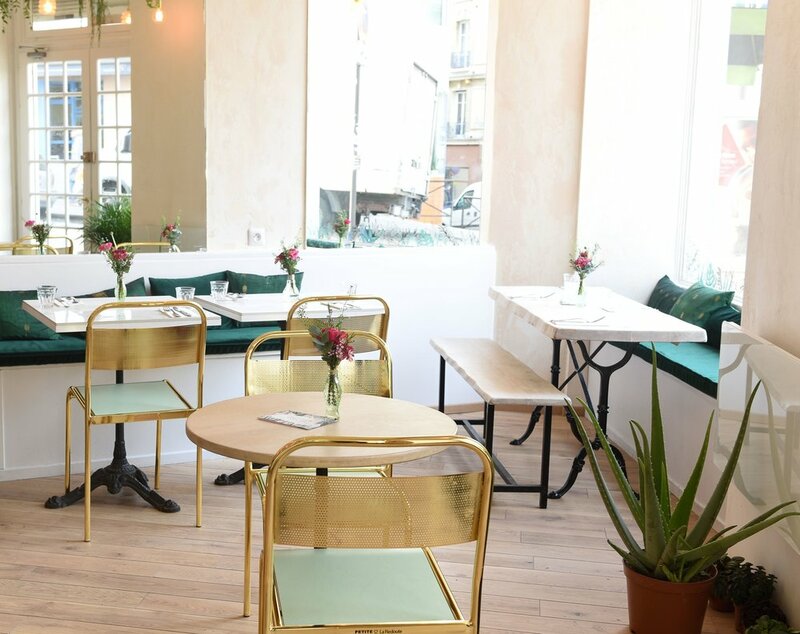 New kid on the block in the up-and-coming North Montmartre neighbourhood, the Abattoir Végétal is a vegan bistro serving healthy, organic, seasonal and mainly-locavore fare. The husband-and-wife team behind the venture came up with the name as the shop was formerly a butchers—which seems wonderfully poetic for its new meat-free reincarnation. Alongside three-course meals, you can also stop in for a cold pressed juice, a matcha latte or even a glass of organic champagne, to be savoured in the immensely Instagrammable setting filled with plants, marble-topped tables and copper and velvet details.